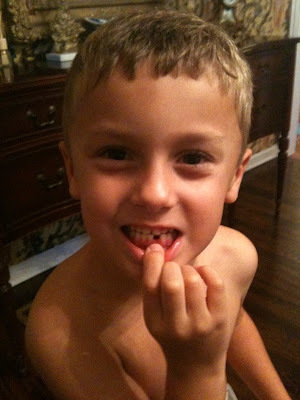 On Friday, October 16, 2009 Graham Dungan lost his very first tooth. He lost it at school during lunch. Here is a picture of the now toothless twerp who will undoubtedly be wishing for his two front teeth for Christmas. This all went just fine until I realized the amount of inflation we have seen in the tooth fairy industry over the last few decades. I remember back to the good old days when I used to walk up hill both ways to school, when we didn't have cell phones or computers and when a lost tooth was only 25 cents - a fair price for a used tooth I might add. For some reason, clearly unbeknownst to me, the price for a gooey old baby tooth is now $5.00. It is up to us to fight for what is right. I don't know where all of this money is coming from. Apparently, the tooth fairy was also a recipient of a government bailout. His tooth purchasing program is now backed by the strength of our tax dollars. Meanwhile, I am still waiting for my bailout. It seems I keep paying more and more and yet I receive less and less. And, just like the bailouts, I am paying the price for someone else's greediness. It's time to take a unified stand against the Tooth Fairy Tax. Okay, okay, Iam done. I fully realize that some purposes are less important than others.